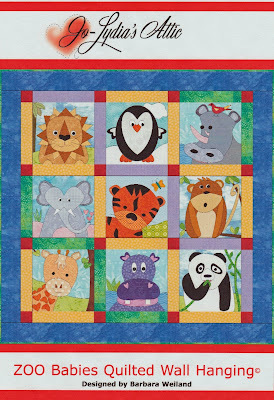 Win from the Gold Coast got together with friends to send quilts for our March Madness offer. The "foxy" quilt isn the first photo is being quilted with the deb's swirls e2e pattern. All the way from Penguin in Tasmania, Kali sent the grey quilt which is being quilted with the circle meander pattern. The third quilt is another from Win, and is being quilted with the roseleaves pattern. Debby from Belivah asked for the I Love It trailing hearts pattern for the last quilt shown. Zoo Babies Quilted Wall Hanging Pattern from The Joy of Sewing...and Quilting, Too!